There are several different styles but the best full extension set of file drawer slides, I have ever used, are from a company called KV or Knape & Vogt. Don’t be fooled by imitations and I also would recommend not believing sales people when they say they have a generic brand from some foreign country that is just as good. Not true my friend. 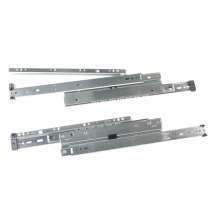 Let me just start by saying that the KV 8400 series is a great all around full extension, ball bearing, drawer slide, but if you really want to install the best you will have to invest a little more. Perhaps double or triple the cost. The 8400 series runners work well for small kitchen drawers, desk file drawers, larger ones and anywhere a full extension application is required. Many times I have used them to get the benefit of having full extension slides at a reasonable price. They have a tendency to make a clunk noise as they are opening and closing though. However, they are still an excellent choice for office file drawers and full slide out designs. The 8400 series from Knap & Vogt are good, but the 8500 series is the best full extension slides for drawers especially for office files. If you want your desk’s file drawers to operate smoothly then pick the 8500 series. They are quiet, smooth and they also have a 150lb capacity rating on them. There are many various drawer slide manufactures, but if you want the best get the KV brand 8500 series for all of your full extension applications. Be ready though because the old saying, “you get what you pay for is so true.” Always use them for large drawers, especially when files are involved for office desk furniture designs. Convince your customers to go with the best and they will be glad that they did. Tip: Use a shot of WD40 on your drawer slide members. It doesn’t matter what kind you have as long as there is metal and some type of roller whether it is plastic or ball bearing the oil will cause things to operate a lot smoother.